VLCC is widely recognized in India and abroad for its holistic, scientific and completely natural weight-management practices and therapeutic beauty solutions addressing the mind and body. Today, with operations at 300 locations in 121 cities across 16 countries, employing nearly 6,000 worldwide, and over 10 million satisfied customers. 1. Services can be availed through prior appointments only. 4. The benefit of this card shall be valid for period as per Company’s policy from time to time. 11. 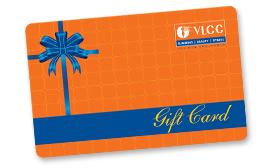 For balance enquiry & expiry, SMS VLCCGC<16 digit Card number> to 9841646669. 12. No returns and no refunds on gift cards, E- gift cards and gift vouchers shipped by GiftBig.com. Please check the refund policy at http://www.giftbig.com/faq/#shipping for further details.